The Jim Prince Award is presented annually in honor and in memory of Jim Prince, a founder of the Friends and early leader and role model. It is the Friends' highest award and is given to that person or persons who most exemplify leadership in outdoor conservation for the region encompassed by the South Cumberland State Park. Named for noted environmental educator Dr. Harry Yeatman, Professor Emeritus from the University of the South, Dr. Yeatman was the first recipient of this award, established in 2007 by the St. Andrew's-Sewanee School, then sponsor of the Trails & Trilliums festival, to honor a person who has made an impact on the South Cumberland Plateau through dedication to this place, and by educating others to appreciate it. Established in 2009, this award goes to an organization or person who has contributed to the South Cumberland Plateau or the Friends of South Cumberland in a significant way. Established by SCSP Manager George Shinn, the Golden Shell Award is presented annually by the Park Manager to a volunteer who exemplifies outstanding service in support of park managment's goals and objectives. Two long-time Friends of South Cumberland State Park leaders have received the state's highest honor, the Robert Sparks Walker Lifetime Achievement Award, given annually by the Tennessee Department of Environment and Conservation (TDEC). 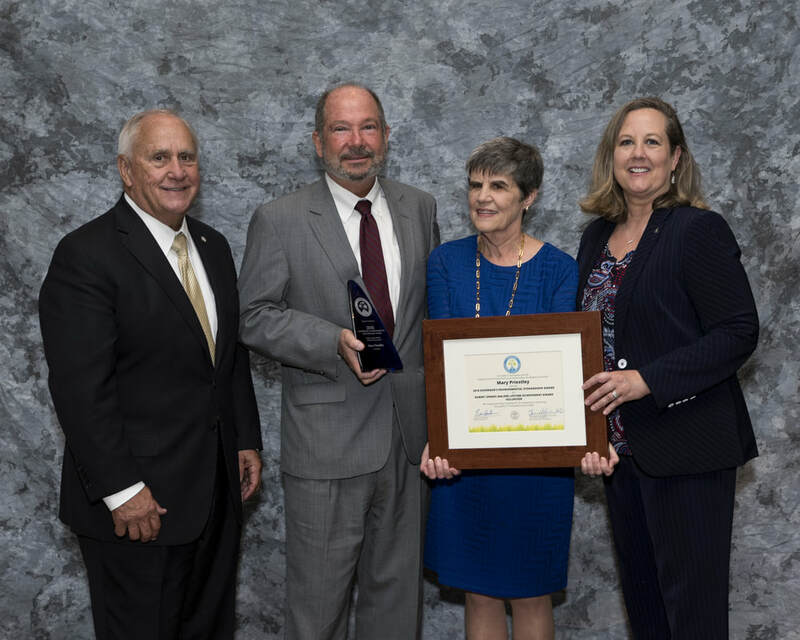 The award is given to an individual who has devoted at least 20 years of effective and valuable service to Tennessee's environmental protection or conservation stewardship. Past winners have demonstrated notable personal achievements in various areas, such as natural resource management, conservation, education, public service, and political support toward Tennessee's conservation and/or environmental protection. At the 2018 awards presentation are, from left, Deputy Governor Jim Henry, TDEC Deputy Commissioner Brock Hill, Priestley and TDEC Commissioner Shari Meghreblian. Mary Priestley, associate curator of the Sewanee Herbarium, was the 2018 recipient of the award. She was honored for her work as an avid volunteer and leader with the Friends group for more than 20 years, and particularly for her efforts to obtain funding to expand the park's resources for outdoor youth education, including the transformation of the exhibit hall at the park's Visitor Center into a hands-on, interactive experience, and creation of outdoor play and learning activities, such as the Storybook Trail and Nature Play areas behind the Visitor Center. Mary served as the Friends' president, and on its board of directors, for many years, and more recently chaired its Education and Outreach committee. 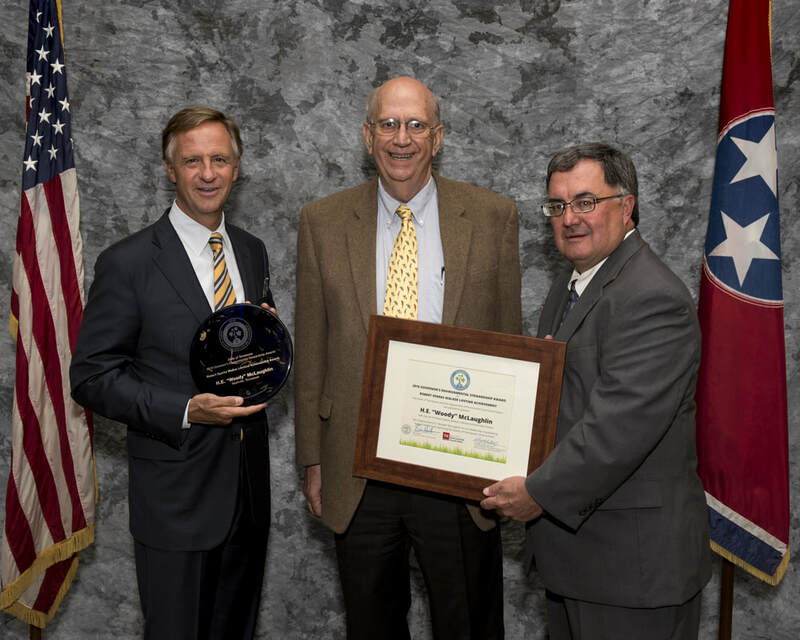 Flanking McLaughlin at the 2016 awards presentation are Tennessee Governor Bill Haslam, left, and TDEC Commissioner Bob Martineau. Woody McLaughlin, a founder and leader of the Friends of South Cumberland State Park, was the 2016 recipient of the award. “Woody’s tireless, good-natured approach to fostering positive working relationships while achieving real conservation results has been essential to preserving priority lands and protecting some of the most special places we enjoy today at South Cumberland State Park,” TDEC Commissioner Bob Martineau said. “We are grateful for his personal commitment and quiet leadership, and we salute the dedicated teamwork demonstrated by the Friends of South Cumberland that have made a real and lasting difference for that state park and those who love it.” McLaughlin received the award for his decades of devotion to the land and people of South Cumberland State Park, dating back to his days as a student at the nearby University of the South. He helped establish the Friends organization in 1993, and served on its board for 18 years. Under the leadership of both Priestley and McLaughlin, the Friends Group decided to launch the Saving Great Spaces Campaign in 2002. During this multi-year campaign, both Mary and Woody served as president of the Friends group, and they worked tirelessly to encourage others to join the effort. This concerted, multi-year conservation campaign leveraged over $8.5 million in total resources, making it possible to add 5,495 acres of priority land at Savage Gulf and the Fiery Gizzard. 2018 Golden Shell honoree Rob Moreland, left, with SCSP Manager George Shinn.